If you want to watch last year’s Grito and attempt a very traditional Independence Day recipe, you can check out the chiles en nogada I made and posted last year here on The Other Side of The Tortilla. On my last trip to Mexico City, my suegra and I visited the Mercado Coyoacán and I came across a little puesto that had every color and design of papel picado that I could have ever imagined. I knew this was exactly what I needed to decorate our home to feel like we had a little piece of Mexico there to celebrate the bicentennial. As some of you already know, I have a serious love affair with this traditional Mexican folk art craft of cutting tissue paper with intricate designs. The tissue paper is sometimes cut by hand and other times, cut with a hammer and chisel to produce multiple pieces at once. 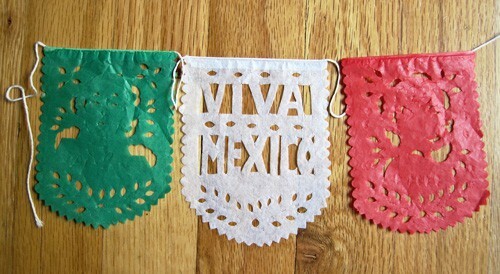 Then, the paper is glued to a string and hung like a banner for various occasions and holidays. I even had a few custom-made strands of novios-themed papel picado made for one of my wedding showers here in Chicago a few years ago. At the mercado, I inspected every little package looking for the perfect string of handmade papel picado to celebrate el Bicentenario. One of the strands I chose, pictured here, has familiar figures from Mexican history and impressive hand cut designs. Knowing it would be awhile before I returned to my favorite mercado, I also wanted to find papel picado for other special occasions. So I sifted through the baskets as the patient man who owned the little stand answered my questions about whether he had this or that and in the colors I wanted. Finally I decided on two strands of bicentenario, two of toda ocasión and two for día de los muertos. 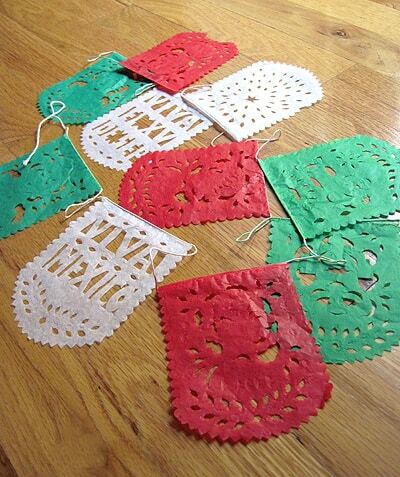 When I visit Mexico City for Christmas in a few months, I’ll be sure to pick up some papel picado Navideño and share photos of it. Since I can’t share a strand of my papel picado Bicentenario with each and every one of you, I thought it fitting to share something else that was green, white and red: my recipe for guacamole a la Mexicana! And to many, there are fewer foods that are more internationally known as being Mexican than this dish. There are many different ways to make guacamole and different people like different ingredients. 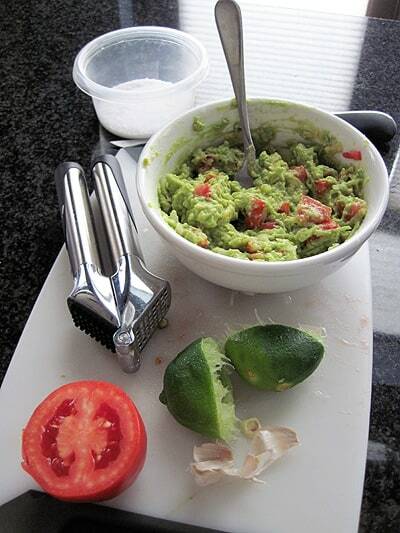 The basics of the recipe below are the avocados, garlic, lime juice and salt. Whether you add the tomato, onion, chile or cilantro is up to you. I typically leave the cilantro out of mine – to each his own depending on personal preference, verdad? But no matter what your preference is, guacamole has been made in this basic and traditional fashion for as long as the cuisine’s history has been recorded. One of the things that I think is so great about celebrating Mexico’s Bicentennial is the increased interest in the culture and cuisine. It’s an opportunity to show others the traditional recipes and methods of cooking that, in some cases, have been used for more than 200 years both by the indigenous inhabitants and the Spaniards and others who came to the New World. So it’s also fitting that thanks to more than 10 years of dedication on the part of the Instituto Nacional de Antropologia y Historia and the Conservatorio de la Cultura Gastronómica Mexicana, this year UNESCO is awarding Mexican cuisine the distinguished honor of recognition as an Intangible Cultural Heritage of Humanity and the official announcement and fanfare will take place at the UNESCO conference in Nairobi, Kenya, from November 15-19. I can’t wait and will definitely be blogging about this momentus occasion in November. I’m hoping that the international recognition honoring our rituals and traditions de la cocina Mexicana will create a continued interest in learning about our rich cultural heritage and inspire more people to incorporate these traditions into their homes like we have in ours. The best classic Mexican guacamole recipe with avocado, tomato, garlic, white onion, serrano chile, cilantro, fresh lime juice and salt. Slice open the avocados, remove pits with a knife and spoon the flesh into a bowl or a molcajete. Mash the avocado coarsely with a fork or a tejolote. Add the finely chopped onion, garlic and salt and incorporate well. Squeeze fresh lime juice over the mixture and stir. Add the diced chiles and tomatoes (and cilantro, if desired) and fold in gently. Serve with hearty tortilla chips. ¡VIVA MÉXICO! ¡VIVA LA INDEPENDENCIA! 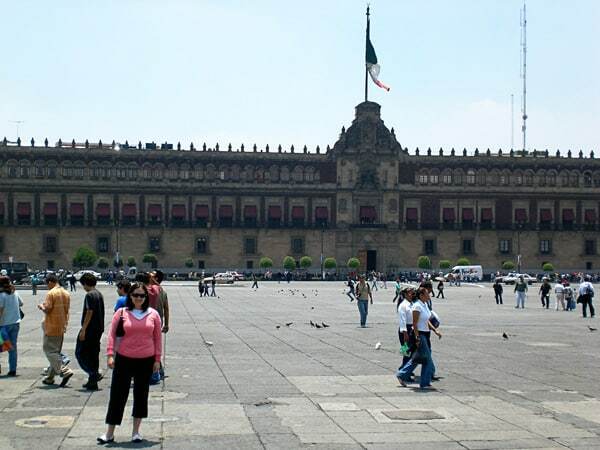 How are you celebrating Mexican Independence and the Bicentenario this year? Did you watch the Grito?